This post is about a sponsored trip paid for the National Pork Board. 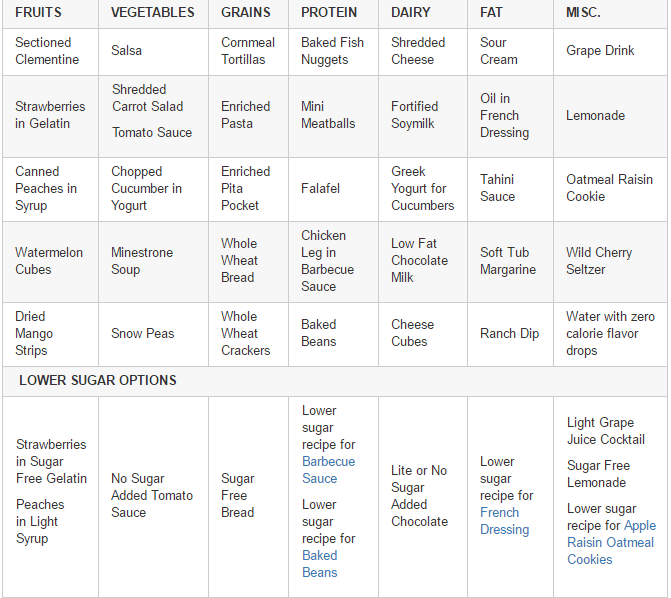 All opinions expressed are my own and I did not receive any compensation to write or share this blog. My day on the Brenneman Pork farm in Washington County Iowa began with a shower. Not a shower in the comfort of my hotel room, but in the locker rooms at the farm. 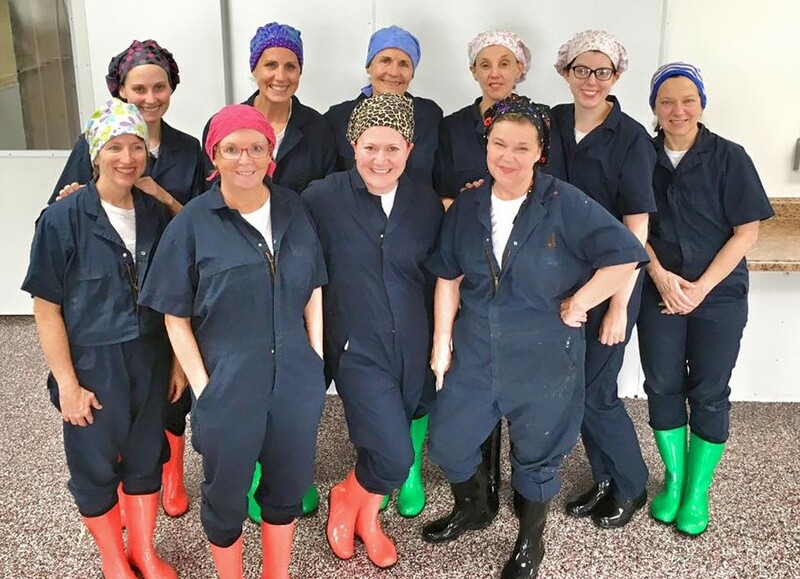 Everyone who enters the gestation buildings – whether farm workers, Brenneman family members or visitors like me and the nine other dietitians on this excursion – must shower and wash their hair before they can enter. We were provided toiletry kits with the soaps and shampoos we could use and were asked not to apply anything else to our bodies after drying ourselves with the towels they provided. That’s right, no moisturizer, no makeup, no deodorant. We then put on the undergarments and jumpsuits they issued to us, surgical caps to cover our damp hair and colorful rubber boots perfect for puddles! Ready to greet the pigs – covered from head scarfs to rubber boots! Now that we were clean enough to meet the birthing sows, we entered a barn housing hundreds of them. 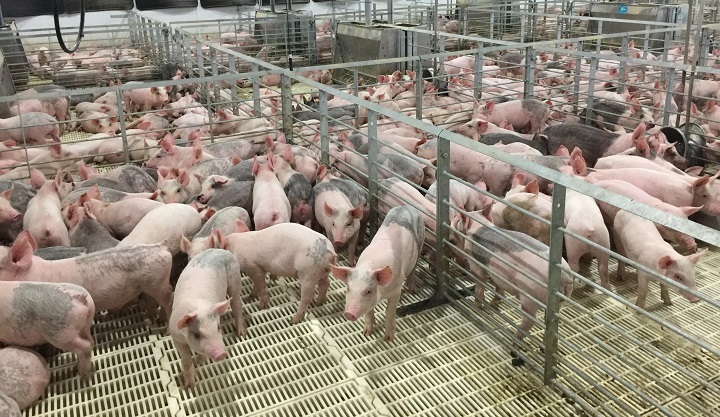 The air temperature was maintained at constant 70 degrees to keep it comfortable for mothers and babies alike (but a bit warm for the workers and guests) and the air quality was continuously filtered to remove any foreign particles that might harm the pigs. We all did our best not to sneeze or cough. Each sow had her own birthing pen equipped with a food and water supply so she could eat on demand. If she had already started to give birth, low-hanging heat lamps were turned on to both dry the newborns and keep them warm as they adjusted to life outside the womb. A clipboard at the end of each pen was used to record the time of each birth and other pertinent details about the new arrivals. These sows were capable of delivering 14-20 piglets and every one of them was an important part of the success of the Brenneman farm. After all, they were in the pork business. The highlight of my trip came when I got to “assist” in the births of two piglets. 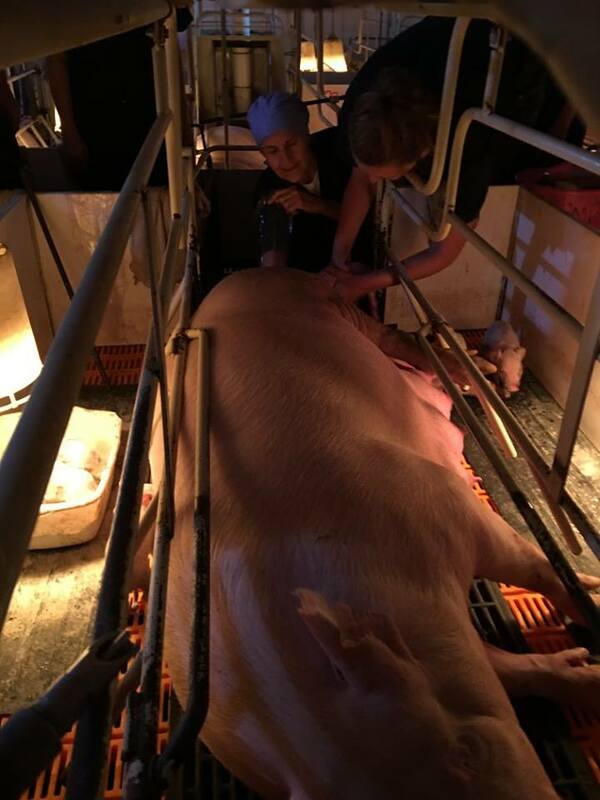 It can take the sow up to 20 minutes to complete each delivery, and she must continue to nurse the piglets that have already been born throughout the delivery process, so a little help is welcomed. The job required slipping a long plastic sleeve with a glove at the end over my entire arm. Then I had to get down on my knees and up close to the back end of my sow. Next, a generous squirt of a lubricant was applied to my covered hand so I could work it up the birth canal in pursuit of the next piglet making its way down. I felt strong, muscular contractions up the entire length of my arm as I maneuvered my hand deeper into the sow in search of a tennis ball-sized orb that would be a head. I was stunned by how hot it was in there. I imagined this is what it would feel like if I were plunging my arm into bubbling quicksand. But when I reached my goal, all my thoughts zeroed in on the carefully explained instructions I had received before beginning this important job. “Wrap two fingers around the head, toward the neck, so you have a firm grip and gently pull the piglet down towards you.” Slowly my arm exited the sow’s body and when my hand emerged there was a 3-4 pound piglet in it. 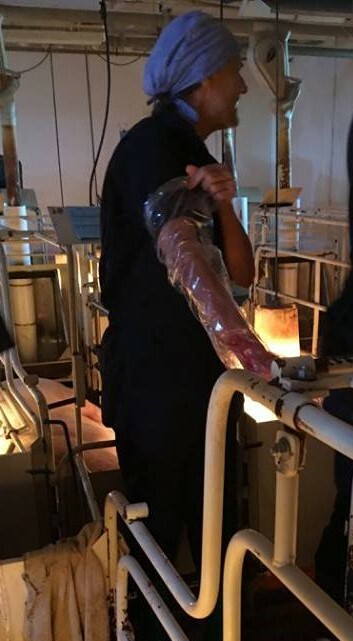 This is what they call “pulling pork” on a pig farm and the experience was absolutely amazing! The care and well-being of the piglets was now the focus of everyone on the farm so these animals could reach their full potential and be ready for market in four to five months. Farm workers monitored what they ate, where they slept, and who they played with, among other things, and were vigilant in their efforts to make sure each pig was free of illness and neglect. The pigs I saw looked, smelled and sounded healthy and happy, and I’m convinced that is reflected in the quality of the pork chops, spare ribs and bacon they produce. I don’t know what more a pig could want out of life? My biggest take-away from the trip was the first-hand knowledge that raising pigs isn’t an easy job. It takes many dedicated people working many demanding hours to produce the best pork possible. It takes a village. Whether you eat pork or not, it’s nice to know the animals are raised with such care and compassion. I only wish all children received the same.